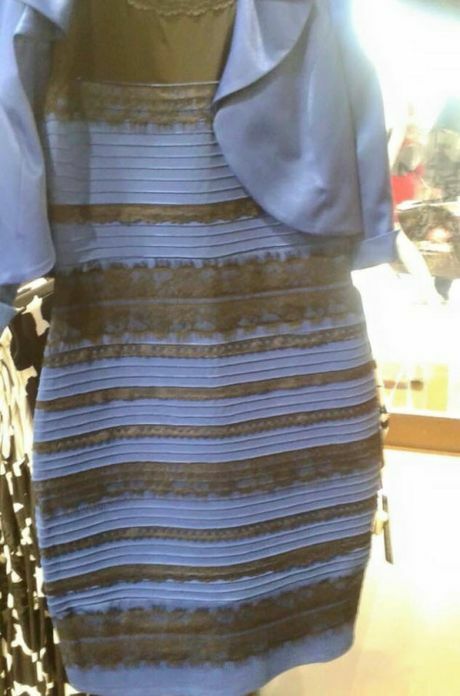 UPDATE: THE dress in its original form is blue and black, and few people would dispute this colour interpretation from viewing the images on the manufacturer's website. However, the multiple copies of the image circulating on the internet, and the way these are viewed on different devices and screens, have imparted various hues that have helped to give rise to different interpretations - and a veritable "twitter storm". Stephen Westland, professor of colour science and technology at Leeds University, said that there are probably three different factors that have created the confusion over whether the dress is blue/black, blue/gold, white/gold or any other various colour combinations. The first is to do with the way the image itself has been taken and copied, which has affected the original sharp contrast between the true black and blue of the original dress. "It's not straight forward. People are seeing the same thing on the same screen and are giving it different names. It would probably never have happened if it wasn't such a poorly washed-out set of images with poor contrast," Professor Westland said. The second issue is about what names we give to describe a colour. The human eye has three different colour-sensitive photoreceptors aimed at the red, blue and green parts of the visible spectrum. Working together it means our brain can distinguish about 3 million colours, but we only have names for about 20 or 30 of the most common ones. In other words, one person's "white" may actually be another person's "light blue" when seen next to a different background or under different lighting conditions. The colours of this dress appear to fall in a fuzzy boundary between different colour names, Professor Westland explained. The third factor influencing the confusion is the natural variability in colour perception between people, where there is about 10 or 15 per cent variation within the human population, even among people who are not colour blind. I would add a final factor that could be playing an important role. The internet is a medium of the crowd, and crowds are well known for displays of mass hysteria. YESTERDAY: SO YOU'VE seen a few people talking about the colour of a dress on Facebook today. Gather a few of your office colleagues/friends/family members around and you will soon find out what all the fuss is about. So the question is: blue and black or white and gold? The photo was originally posted to tumblr yesterday with the caption: "guys please help me - is this dress white and gold, or blue and black? Me and my friends can't agree and we are freaking the f**k out", and has proceeded to cause mayhem in the lives of all sane people since. Post by Queensland Police Service. After a great deal of internet searching and wading through ridiculous claims that a persons emotions caused them to see the colours differently, Buzzfeed came back with the only plausable explanation. They asked a post production supervisor in Los Angeles to weigh in and he said the photo - taken with a camera phone in poor lighting- casts the white in a blue tone and mutes the gold to a darker colour. What colours do you see in the dress? This poll ended on 06 March 2015.